If Pat Callahan is in it, you can be sure it’s a visual space. The familiar terrain she traverses, early mornings before heading into work, becomes her first visual space of the day. Along her jogging route, she may spot a shiny object that will end up on her jewelry-making table later. After a full day at the office, she looks forward to shifting creative gears - at least some evenings - for a few hours in her studio, her third visual space. As her eye for design has become more seasoned, more experienced, she has allowed new aspects of art to inform a subsequent one. Jewelry is the most recent addition to her creative output. Callahan explains the evolution of her creative output. First and foremost, there was drawing, “and certainly I still draw. As a teen I drew with dedication and loved the few figure drawing classes I had during college. 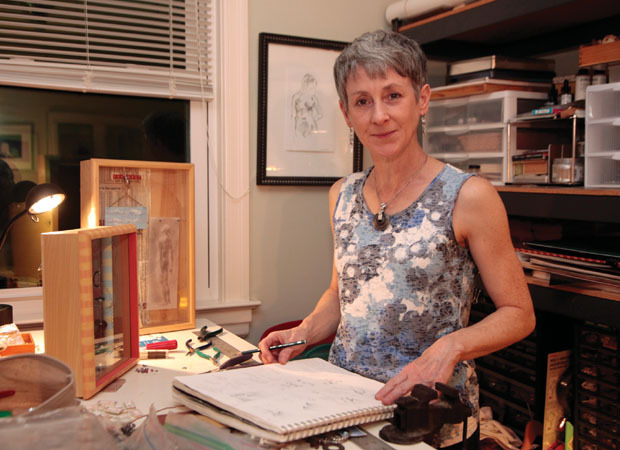 Somehow I stopped drawing after college, I guess to get my career underway.” Her design career has included work with a few advertising agencies and both the Virginia Museum of Fine Art and the Columbia Museum of Art (CMA). In time, her visual spaces had her thinking inside the box – via crafting contemporary shadow boxes. For these constructions she pulled innate skills from the building and engineering environment in which she was reared. “My father was is a mechanical engineer who built and repaired whatever was needed at home. I marvel still at his inventiveness. He lived the ‘mantra’: If you look at something long enough, you can figure it out.” Callahan’s shadowboxes arouse questions, display statements, relay stories, and the artist conveys her thoughts deftly with what she can plunder as her art elements. Most recently, Callahan allowed jewelry-making to become the focus of her creative output. “Wire techniques and found objects that I was using with the boxes led to handcrafting jewelry. Like elements in the shadowboxes, incorporated from found objects I had long collected, the jewelry-making allows me to repurpose cast-off things into something beautiful, something inventive and unique. Art that can be worn.” Callahan added that using found material is also very cost effective for a jewelry designer. So far, Callahan achieves her jewelry creations through only cold connections – no soldering of the metal she repurposes into distinctive jewelry. “I marry the parts as efficiently as possible, using tension and pressure, bringing them into an exact fit.” Callahan has heard a growing number of repeat customers portray her jewelry as exquisite, which she interprets as a tribute to the pieces’ clean lines and simplicity. In many ways this artist’s jewelry mirrors her drawings from life. Each piece is both ordinary and unique, and beautifully real.